This weekend I went to The Lowry Theatre with friends to watch a new play, Toxic Bankers, written by Andrew Taylor and Desmond O'Connor (not the one who appeared on Morecambe and Wise!). I have seen Des O'Connor perform at burlesque venues many times, and was certainly looking forward to seeing how his musical works fitted in with Andrew Taylor's writing. It was in no doubt a very contemporary play, and although it centered on the financial world and the problems faced by Greece and the Euro in general, it was by no means as dull as it sounds. It was a thoroughly enjoyable 2 hours, with a darkly comedic theme, even though Desmond's more, er, risqué side was toned down a little to fit the storyline. All-in-all a very different option from Carousel, which was playing in another part of the Theatre. I've been spending a lot of time at Salford Quays recently - as well as my recent modelling evening there and my visit to The Lowry Theatre, I also spent a little time there on Friday. The recent weather has been glorious, of course, and even with the hotel room air-conditioning on full-blast, it was decidedly hot, sweaty and sticky - even more so after a two-hour 'workout' - thank you for that, 'G'! Dexi - Salford Quays, post 'workout'. I'm certainly hoping it stays like this for next wekeend, as it's the East-Lancs Railways 1940's event, which I'm really looking forward to. Before then, I'm back in Manchester on Monday 28th May, and looking forward to getting all hot, sweaty and sticking... again. After the chill of Saturday at Haworth's 1940's event, I was very grateful for a return to warmer weather yesterday evening, as I had promised to do some modelling for a local camera group. The location was the fabulously photogenic Salford Quays, and I decided to put on my long glamorous Massimo Dutti dress for the occasion, as it worked so well for some of my original website pictures. It was a great evening, and I'm looking forward to seeing some of the finished results. Some of the glimpses I saw of the pictures from the group on the evening looked superb. It certainly took me back to my years of modelling professionally, although had I discarded my clothes for the cameras as quickly as I used to, then there may have been some extra shots of me being escorted away by Manchester's finest boys in blue. As it was I managed to behave (for once), with only the occasional glimpse of stocking tops for the passing public to stare at. This coming weekend is also promising to be an interesting one... but that will be for my next blog post! 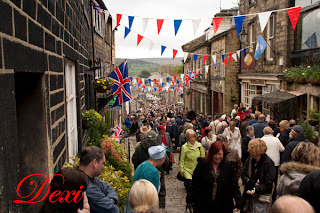 For the last few years, May has always been the start of the 1940's weekend events for me - and Haworth's 1940 wartime weekend is usually the first of them. Haworth is a lovely village in Yorkshire, and on the 1940's weekends the pretty Main Street and park become the focus point for a celebration of nostalgia and remembrance. I always like to arrive very early, before many of the crowds and coachloads, to enjoy some breakfast (at Cobbles and Clay - perfect), admire the first vintage vehicles to arrive and meet up with old friends who also appreciate the glamour and style of a bygone age. Walking up Main Street when it is peaceful and quiet is always a pleasure, and even the steep cobbled street isn't enough to keep me out of my high heels. It was certainly colder than previous years, but despite the heavy cloud I am glad to say that the rain kept away. There is always plenty to keep the interest going for a full day, though. The sweet little Old School Rooms had a vintage fair, and offered the opportunity to try on a few outfits and spend a little time inside with a hot drink. Away at the other end of Main Street the village park had a display of military vehicles, a brass band and more stalls. Negotiating between the two via Main Street became challenging once the crowds had arrived by mid-morning. All-in-all, a great day out, an excuse (as if I need one!) to get glammed up and slip on the seamed stockings again. With more events like this already lined up in my calendar, I'm certainly looking forward to the summer. Bank Holiday Weekend - May Day, May Day! I feel like I'm living out of a suitacse at the moment - I haven't spent much time at home since I began my recent bunch of tours. Even my time in Manchester has, for a portion of it, been spent in hotel rooms. However, on the positive side of things my tours have been fun and productive. And so it was that I travelled to London for the Bank Holiday Weekend, and another visit to Torture Garden. In truth, the journey south was fated to be a bad one. The tickets for the TG Birthday Ball got waylaid, a fact I didn't realise until I had already reached Staffordshire. That meant veering away from my planned route in order to find a cybercafe where I could reprint my E-Tickets. E-Tickets....if anyone can explain, when I book an event online, pay online, and then have to print my own tickets, why do I have to pay a 'booking fee'? Anyway, I digress, much like my journey to London. No sooner had I joined the motorway than the sign popped up... M40 closed, for three junctions. Another detour, this time across country to M1. Close by was a 'traffic enforcement officer' and I asked him why I had been ticketed. "The Arsenal are playing at home today, didn't you know? It means no parking anywhere around here." No, I bloody didn't know, but thanks for telling me. 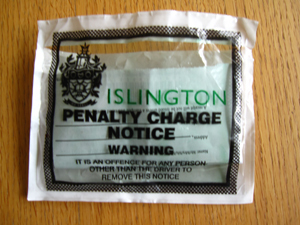 I'd love to know why Islington Council thinks this is supporting their local businesses and people. I bet they are the ones behind all those E-Tickets, too. Nevermind, I thought, as I left Holloway Road, it's not too far over the Thames to my apartment. Or so I thought.... with many of the main roads through the City areas closed, there were more detours all over the east-side of London. Over an hour later I got to my apartment. So, now back in Manchester, although very briefly - on Wednesday 9th May I am heading over to Anglia to the city of Norwich for three days, and looking forward to seeing some more of the country that I haven't visited before.